We’re huge fans of Transformers. Before you click out to go check the weather or something, we mean the 1986 cartoon Transformers: The Movie. It’s got everything, great 80’s synth ballads, the proper noise when the robots change and.... Orson Welles. 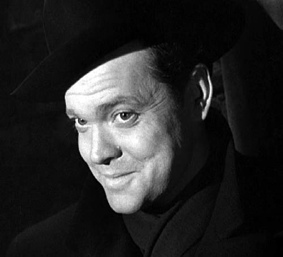 Yup, that’s correct, THE Orson Welles. He plays a planet. And not a nice planet at that, he plays Unicron. Which I’m pretty sure is a planet. Or at least a robot that transforms into a planet. So probably not one of Hasbro’s best sellers. Like the Megatron toy that transformed into a gun, making it impossible to play with in the same scenario as all the other Transformers. Anyway, the point that I’m getting to here is that Transformers: The Movie was pretty much Orson Welles’ last film before he died in 1985. This got us thinking, how many other acting greats have finished their career (terminally or through retirement) on a somewhat surprising note? So we had a dig and presented below, in no particular order is Part I of our look at Surprising Swan Songs. You don’t need me to biog Welles for you really. He started with a bang by broadcasting The War of The Worlds as a Halloween prank and scaring half of America to death. He directed the Greatest Film Ever Made in 1941 - Citizen Kane and also starred in a list of films using his fantastically sonorous voice to great effect. He instantly endeared himself to Broken Shark by playing Lew Lord in The Muppet Movie in 1979 - “Miss Tracy, prepare the standard 'Rich and Famous' contract for Kermit the Frog and Company”. Magical. Towards the end of his career, he did make some odd appearances, such as the voice of Robin Masters in Magnum PI (we love that show) but it was his near final film which stands out as mentioned above. A Shakespearian actor of some note in the 1970’s Julia had a pretty varied acting career. He played alongside Oscar winning William Hurt in The Kiss of The Spider Woman in 1985, probably he most respected role. But it was as the patriarch Gomez of the Adams Family that he really became a household name. A more suitable actor for the role there is not, he was perfect as the cigar-chomping, golf club swinging Gomez. His final film? Well, suffice to say it’s probably best remembered as one of pre-national treasure Kylie Mingoue’s acting forays - Street Fighter: The Movie. Julia crops up, second billed as M. Bison. Who if memory serves, in the game was the final bad guy you had to fight. I’m sure it translates well into the film which I have seen but don’t really want to spend too much time discussing here. Julia died tragically young at the age of 54. The first of the people on our list who is still with us but no longer giving us enjoyment at the cinema. Connery also had a pretty varied career, one minute he was defining one of the greatest screen icons ever created, the next he was looking suspicious and slightly lecherous next to Catherine Zeta-Jones. He will of course be forever connected to James Bond but he also knew how to drag a movie up beyond what should have been expected (The Rock). He had a close shave with The Avengers mess in 1998 but it was the spectacularly poor The League of Extraordinary Gentlemen (and one woman) that finally caused him to knock it all on the head and disappear out onto the back nine. He’s made some appearances since, notably in the reasonably well received From Russia with Love on the Playstation 2 but sadly not to the big screen. Most unforgivably this has meant the death of Indy’s dad. We still can’t believe he’s no longer with us. A true giant of the cinema and one of our all-time favourite actors, the list is honestly too long to fit in here. We’ll just pick out Butch Cassidy and the knife fight. You know what we mean. Newman still well and truly had it when he starred in and was nominated for an Oscar in The Road to Perdition (aged 77 in 2002). And he pulled off one of the feats of Oscardom, winning the award for his performance in the Colour of Money (1986), reprising his role from 1961’s The Hustler. That’s right, he won an Oscar for an 80’s sequel to a 60’s film. Impressive. His final performance was as Doc in one of Pixar’s least impressive animations - Cars. We still miss him. The absolute definition of an English Shakespearean Actor (capital intended), Sir Larry was an institution. Probably better know for his work on the stage and for forgetting to read out the nominations for Best Picture at the Oscars in 1985, he also featured in some 86 films, amongst them a good number of Shakespeare adaptations. His final ‘proper’ film? Wild Geese II, playing Rudolf Hess. Probably one of the worst films in this whole list. The first was an excuse for Richard Burton and his mates to go drinking in the sun. The sequel was well and truly pointless, featuring none of the original cast. It seems an odd end to an unparalleled career but fortunately one that probably won’t be remembered over Sir Larry’s turn as Heathcliff in 1939’s Wuthering Heights.